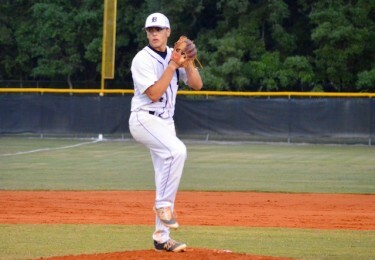 Jonah Scolaro threw a no-hitter Tuesday night against the Riverview Sharks to advance to the district championship. 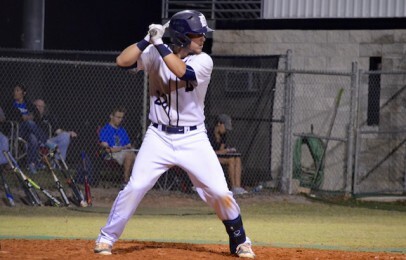 Durant’s Jonah Scolaro threw a no-hitter Tuesday night to defeat the Riverview Sharks in an 8A-6 district semifinal to advance to the district championship. The Cougars and the Sharks locked heads in a classic pitcher’s duel between Scolaro and Riverview ace Jordon Leasure. Fans were on the edge of their seats as the two matched each other pitch-for-pitch throughout most of the game. In the end Durant came out on top 1-0. Leasure threw five strong innings, allowing only three hits, one earned run and a walk on the night. But the Shark’s ace threw two hanging fastballs early in the bottom of the first and the Cougars took advantage. Catcher Jake Sullivan crushed the first one to the left field wall for a quick double. On the next pitch shortstop Jonathan Herman hit the second hanging fastball to right, scoring courtesy-runner Jarred Mejia from second for the game’s only run. “I had faced Leasure earlier in the year and I knew going up to the plate that he was going to give me that first one. I didn’t miss and sent it to the wall,” Sullivan said. Scolaro didn’t make a mistake all night, walking only four and striking out 13 while going the distance. A strong curveball and trust in his catcher behind the plate are what Scolaro said were the key to his success. “My curveball was working great and knowing that Jake and my team were behind me really settled me down and allowed me to find my groove,” Scolaro said. Durant manager Butch Valdes was proud of his team but not surprised at all by Scolaro’s performance, stating that’s exactly what they expect from their best pitcher. Valdes also was looking forward to the district championship against Plant City. Second Baseman Sullivan prepares for a pitch. Sullivan was 1-for-3 on the night and scored the games only run. Even though the Sharks did not record any hits, they did take advantage of what was given to them and threatened twice during the game. Their first opportunity came in the fifth. Designated hitter Darius Stibling led off the inning with a walk. Catcher Josh Rulli then reached on a throwing error and Tyler Salomon took the second walk of the inning to load the bases with only one out. Scolaro gathered himself and struck out the next two batters, ending the inning and squashing Riverview’s chances. In the top of the seventh the Sharks again put Scolaro in a jam. Second baseman Wesley Llaurador walked and Salomon reached on an error to put men at first and second. Left fielder Tyler Roschfska then laid down a perfect sacrifice bunt to move the runners to second and third with two outs. Scolaro collected his nerves and struck out the final batter for the last out of the game, securing victory and his no-hitter. Riverview manager Bill Leiby was disappointed, but congratulated Durant on keeping his guys off balance all night.